Pioneers in the industry, we offer heavy duty slat chain conveyor and slat chain conveyor from India. We offer a high-quality range of Heavy Duty Slat Chain Conveyor that are extensively used for assembly of equipment, painting of components and others. Heavy Duty Slat Chain Conveyor can be practically used to convey any type of solid particles. Heavy Duty Slat Chain Conveyor, that we provide, is mainly used for the assembly and inspection of bulky and heavy material. We are the leading manufacturer and supplier of Heavy Duty Slat Chain Conveyor in Tamilnadu, Kerala, Coimbatore, Tirupur, Karur, Salem, Chennai etc. We specialize in providing a qualitative range of Slat Chain Conveyor. 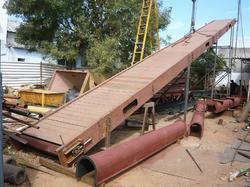 These easy link conveyors are of huge capacity that can transport various heavy materials. Our Slat Chain Conveyor is an efficient material handling equipment that is used to carry different kinds of materials from one place to another. These are manufactured in different configurations and sizes to meet varying needs and applications. We are the leading manufacturer and supplier of Slat Chain Conveyor in Tamilnadu, Kerala, Coimbatore, Tirupur, Karur, Salem, Chennai etc.